Musings about some of my favorite fantasy literature for young readers, comics old and new, the peculiar publishing industry, the future of books, kids today, and the writing process. In turning the evacuation of six American diplomats out of Teheran in 1979 into a Hollywood movie, Argo had to distort the historical events, as I discussed back here. There simply could not have been a mass-market movie any other way. In contrast, the historical distortions of Zero Dark Thirty are less apparent but also less necessary. The major issue, which has reached the level of critical letters from a bipartisan group of US Senators, is whether torturous interrogation methods led to information necessary for finding Osama bin Laden in Abbottabad, Pakistan. Much of the historical record is secret and debated, but there have been enough revelations to say that Zero Dark Thirty skews reality. There can be no mistaking what Zero Dark Thirty shows: torture plays an outsized part in Maya’s success. The first detainee she helps to interrogate is Ammar. He is tortured extensively in the film’s opening sequence, immediately after we hear the voices of World Trade Center victims. Ammar’s face is swollen; we see him strung up by ropes, waterboarded, sexually humiliated, deprived of sleep through the blasting of loud music, and stuffed into a small wooden box. During his ordeal, Ammar does not initially give up reliable information. After he has been subdued and fooled into thinking that he has already been cooperative while delirious, however, he gives up vital intelligence about the courier over a comfortable meal. Another prisoner gives Maya information while telling her, “I have no desire to be tortured again.” Coll concludes, “In virtually every instance in the film where Maya extracts important clues from prisoners, then, torture is a factor.” Those particular detainees are fictional composites, though the movie refers to other, real prisoners, such as “KSM,” or Khalid Sheikh Muhammed. I think Zero Dark Thirty also suggests that the torture is horrifying, undesirable, even possibly harmful to everyone involved. It seems to burn out Maya’s mentor from the first scene. There’s a strong but implicit theme that Maya’s dogged, generally nonviolent techniques are better. In essence, the movie implies that she and her CIA colleagues have to grow beyond the violent interrogations. But the movie leaves out historical details that would have strengthened that theme. First of all, the movie doesn’t show Maya or other investigators being thrown off by false leads that prisoners offered just to stop torture. It shows other sorts of dead ends and a sneak attack on Maya’s agency by Islamist terrorists. But Zero Dark Thirty ignores the drama inherent in one powerful argument against torture: it doesn’t produce reliable information. Though the movie shows Maya debating with her colleagues and higher-ups about her conclusions, it never shows how some officials, notably the FBI, objected to the use of torture. The filmmakers bypassed that source of drama and the chance to show character growth. Furthermore, Zero Dark Thirty presents torture sessions as directed, indeed improvised, by a CIA agent in the field. It doesn’t show the whole bureaucratic apparatus that our government built around the practice, with lawyers, psychologists, and physicians involved in planning and supervising interrogation sessions. Some intelligence professionals have called that inaccurate. The narrative effect is that Zero Dark Thirty insulates its audience from how the harsh treatment we’re seeing isn’t the tactic of one desperate agent but the considered policy of the US government. I call those omissions unnecessary because a more accurate portrayal could have been just as dramatic, perhaps more so. Until the final raid on Abbottabad, the movie gets its drama from Maya’s push against her agency’s entrenched thinking, her struggle to find useful leads in a haystack of vague hints. Showing her come to doubt the value of the torture policy and struggle with false leads would have fit right into that storyline—and presented a more accurate history. 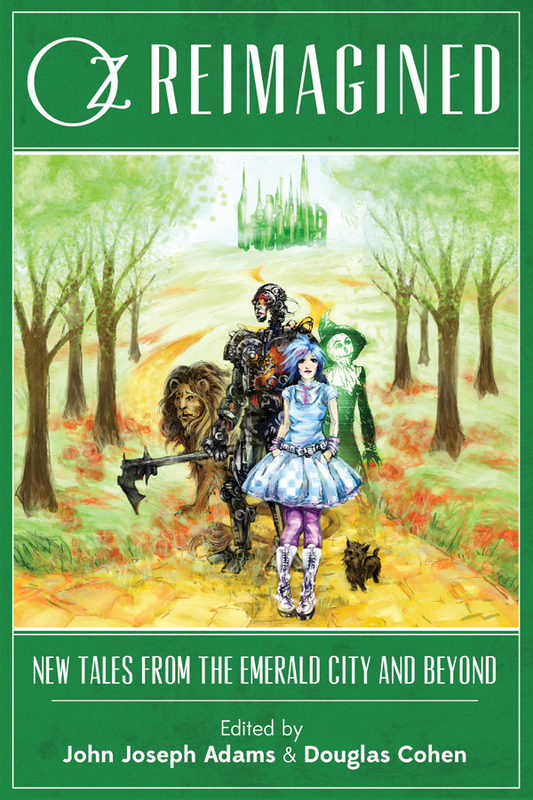 Today is the official publication date of Oz Reimagined, an anthology edited by John Joseph Adams and Douglas Cohen. As io9 reported last month, the individual stories in this collection will also be on sale as Kindle Singles. Among the contributors, Jane Yolen wrote “Blown Away,” which has the sell line: “What if Toto was dead and stuffed, Ozma was a circus freak, and everything you thought you knew as Oz was really right here in Kansas?” Way to sell the magic, Jane! Dale Bailey’s “City So Bright” is summarized as “Marxism comes to the Emerald City.” Didn’t it already? More controversial, perhaps, is Orson Scott Card’s “Off to See the Emperor.” Not because of its approach to reimagining Oz—“Frank Baum’s son has the real experiences that his father later fictionalized.”—but because Card has become increasingly notorious for his homophobic writing and activism. Some Superman fans are dismayed that he’s scripting a story for DC Comics. Will Oz fans want to buy a book that includes Card’s work? Earlier this month, Brian Cronin’s “Comic Book Legends Revealed” series at CBR discussed how Carrie Kelley, the possible future Robin of The Dark Knight Returns, emerged from the interactions of three highly praised writer-artists of the 1980s. The history begins in 1982 when Jaime Hernandez drew his character Maggie Chascarrillo as Robin for The Comics Journal. That was only a year after he and his brother self-published their first Love and Rockets issue, but they had been picked up by Fantagraphics, also publisher of The Comics Journal. This art was therefore, I suspect, both promotion and a dig at mainstream comics. 1985. At 30,000 feet. I talk to cartoonist John Byrne about Batman. John talks to me about Robin. “Robin must be a girl,” he says. 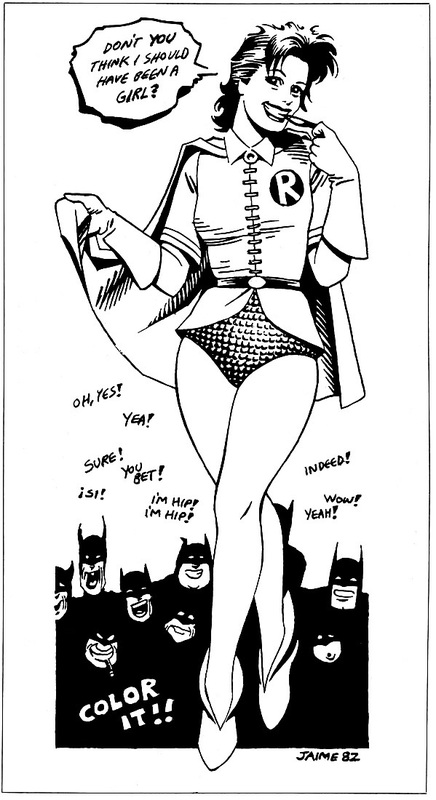 He mentions a drawing by Love & Rockets artist Jaime Hernandez of a female Robin. To prove his point, John provides me with a pencil sketch of his own. Byrne called that a “napkin-sketch.” Here’s his tribute to the characters Miller eventually designed from 2008. Miller tweaked the established Robin design to be even more bright than before. Carrie had the red hair that DC’s licensing department didn’t allow the first Jason Todd to keep, and she wore it swept upwards for more prominence. Instead of a dark domino mask, her eyes were covered by sunglasses with light green lenses. The contrast in that Dynamic Duo, brightly colored versus dark gray, contributed to some of The Dark Knight Returns’s most iconic pages, such as this splash page priced at more than $100,000 two years ago. Some of you may recall that it was on a plane ride home from Altlanta that I suggested to Frank Miller some of the elements that became his female Robin. Those which he didn't use, I used in Radio Girl. Radio Girl was the Cold War–era sidekick to the Torch of Liberty in a superhero universe that Byrne created in the mid-1990s. 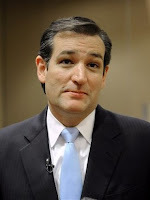 Ted Cruz, Republican of Texas, has quickly made himself into the prime champion of OIP Derangement Syndrome in the U.S. Senate. Specifically, the type that manifests itself in making wild claims without evidence about President Barack Obama and anything associated with him. Cruz presented no evidence for that wild yet specific accusation. Charles Fried, a prominent Republican at Harvard Law School who actually mentored Cruz, scoffed at all parts of his claim, from the lack of other known Republicans on the faculty to the idea that any of his colleagues wanted to overthrow the government. During committee debate on the nomination of former senator Chuck Hagel to the Secretary of Defense, Cruz declared: “It is at a minimum relevant to know if that $200,000 that he deposited in his bank account came directly from Saudi Arabia, came directly from North Korea.” Cruz of course presented no evidence of either possibility. Even his fellow Republicans chided him. Cruz also said that “Hagel’s nomination has been publicly celebrated by the Iranian government.” He couldn’t provide good evidence to support that claim. Politifact gave Cruz’s statement its worst rating, Pants on Fire. In January Cruz told a right-wing audience that Hagel and John Kerry, now secretary of state, are “less than ardent fans of the U.S. military.” Cruz presented no evidence for that claim, either. Nor did he address the evidence that both men volunteered for military service while the US was at war. Cruz, in contrast, has never served in the military; he spent his early twenties at Harvard Law School. This place would have totally confused me when I was a ten-year-old asking my parents for anything related to the Oz books. This Land of Oz is in the news because it was recently purchased by Monsignor Kevin Wallin, allegedly as a way to launder the proceeds of dealing methamphetamines, though he may also have been a customer. So I signed up to be in a show dedicated to the Wizard of Oz. Seemed like a fun theme to work with as the film has so much wonderful imagery. I committed to doing two pieces. Once I got started, the obsession set in. I’d finish a piece and say “That’s the last one” … and then I’d think of something else I wanted to draw. Ended up doing eight pieces for the show and just had a blast creating this art. All eight movie-inspired images can be enjoyed at Murphy’s Mardi-Art site and Etsy store. “Going abroad” refers to a sentence of transportation to one of Britain’s penal colonies, most likely Australia. Charles Dickens never actually shows the Dodger’s sentencing, but his youth makes him an unlikely candidate for hanging (yet). Instead, we can imagine Jack Dawkins starting a new life in the antipodes, perhaps even becoming the gentleman he’s always styled himself to be. Titled Dodge and Twist, studio Sony's revisionist take follows…a more comedic approach and is based on an original screenplay by Cole Haddon, writer of the forthcoming US TV series Dracula. The film will portray the two characters as rivals on opposite sides of the law in Victorian London during an episode in which someone tries to steal the crown jewels. The script is based on an original idea by producer Ahmet Zappa, son of rock legend Frank, which is said to be influenced by the success of Guy Ritchie's Sherlock Holmes films. This isn’t the first time imaginative dramatists have invented new fates for the Dodger. In the 1968 Oliver!, of course, he and Fagin escape arrest and enjoy the movie’s final number. More to the point, in 1980 British television came up with The Further Adventures of Oliver Twist, in which the title character goes off to a posh boarding school and there finds Jack Dawkins, of all people. The two boys end up back on the dark streets of London. That story also appeared as a paperback novel and a comic. Australian television gave us Escape of the Artful Dodger in 2001. That story transported the Dodger to Australia, but also sent Oliver there in more respectable fashion. Once again, Oliver ends up on the wrong side of the law, and the Dodger helps him out. Those latter-day sequels, like Dodge and Twist, recognize that Oliver without the Victorian underworld to threaten him is a bourgeois nonentity. At the same time, the Dodger’s class-conscious thievery isn’t that endearing unless he’s got a little mate to reluctantly look after. It’s a natural buddy movie. In fact, British writer Tony Lee worked on a story called Dodge & Twist for years, first as a graphic novel with Paul Peart-Smith (PDF download of preview from 2007) and then as a self-published prose novel (two-chapter preview from 2011). It shows Oliver, having lost his money, meeting Jack, back from Australia—and we’re right back in Dickens’s world. Zappa’s story is set twenty years after Dickens’s novel; Lee’s is set twelve years after. Zappa’s story uses the crown jewels as the maguffin; Lee’s uses the Koh-i-noor diamond. The Hollywood Reporter said Lee’s take was “more serious.” Lee said he discussed his idea with Zappa a few years back. Isn’t the public domain delightful? I hadn’t realized that in December 2011 Ross converted his blog about imaginary issues of The Brave and the Bold (featuring Batman team-ups) into imaginary issues of Super-Team Family, featuring team-ups of any superheroes. Which of course means more opportunity for Robin. Since Ross uses the grown-up Earth-2 Robin’s short-lived chest emblem as his own avatar, I assume that was part of the appeal for him, too. As someone who collected all the original Invaders magazines (including Annuals, crossovers, and What If? 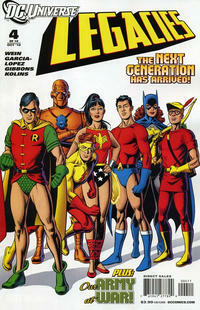 ), my favorite new cover might be this one, letting the kid sidekicks of that 1940s team meet the 1960s Teen Titans. But I don’t think we need a direct replacement. Besides, Bucky was a sensational character find of 1941. Around 1993, as I explained in this posting, I was looking for new science activities for kids that involved soap. I tried microwaving a bar of Ivory soap and was, so far as I know, the first person to see the strange results. I published my findings in a book called Soap Science. Twenty years later, and I’m finding online videos of families doing that very activity (and in some cases wearing eye protection, too!). In fact, those families go further than I dared to tell kids to try on their own; I couldn’t know if parents would be present or would handle the aroma. And those videos are getting tens of thousands of views. Such a strange thing to take pride in. John McCain and Lindsey Graham were among the Republican Senators who this week filibustered President Barack Obama’s nominee for Secretary of Defense Chuck Hagel. Hagel is their former colleague and friend, and they’d said they wouldn’t filibuster that nomination. But they insist that they have too many unanswered questions about Libya. There are some questions about Libya I’d like to see answered, too. On 14 Aug 2009, Sens. McCain, Graham, Joseph Lieberman (now retired), and Susan Collins (who voted against the filibuster) met with Libya’s dictator, Muammar Qadhafi, and his son and advisor, Muatassim al-Qadhafi. 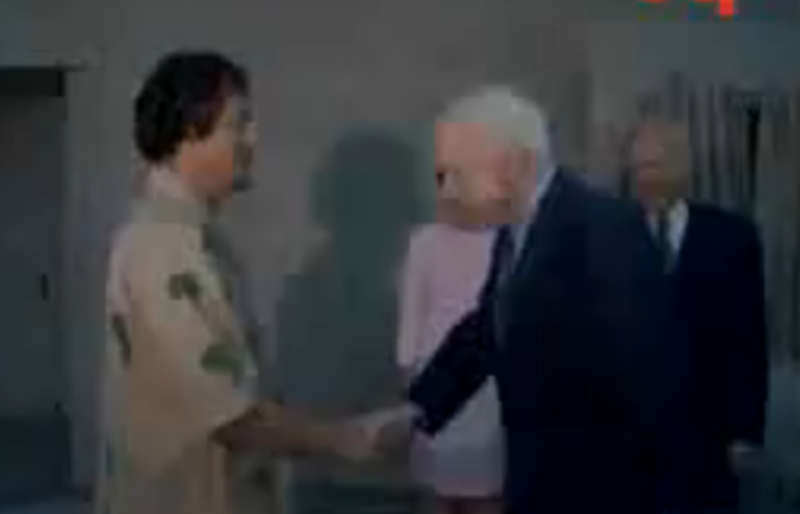 There’s brief video footage of the senators greeting the Qadhafis in Tripoli. That was part of a gingerly warming of relations between the US and Libya that began in the Bush-Cheney administration. “We discussed the possibility of moving ahead with the provision of nonlethal defense equipment to the government of Libya,“ McCain said during a press conference. He gave no details on the kind of military equipment Washington is offering. Senator McCain assured Muatassim that the United States wanted to provide Libya with the equipment it needs for its security. He stated that he understood Libya’s requests regarding the rehabilitation of its eight C130s [cargo planes purchased from Lockheed but never delivered] and pledged to see what he could do to move things forward in Congress. . . . Senators McCain and Graham conveyed the U.S. interest in continuing the progress of the bilateral relationship and pledged to try to resolve the C130 issue with Congress and Defense Secretary Gates. Those cargo planes had been mentioned in the briefing document provided to McCain and his colleagues by the State Department, which also said: “It would be helpful if you could provide congressional perspectives on lethal sales to Libya and the security commitments that must be fulfilled prior to any U.S. consideration of lethal sales.” So the senators were prepared for that topic. After the diplomatic cables leaked, McCain denied having said the things they described. He insisted the cable was simply incorrect. McCain indeed hadn’t reviewed and cleared it at the time. But he evidently felt the press and public should accept his word that the US diplomats whose job was to accurately record and report the conversation would be wrong on important points. Graham chuckled Thursday when he was asked whether he’d ever delivered on his pledge to the Gadhafis to endeavor to free up the C-130s. There are a lot of discrepancies in the reports of this episode: between the senators and the State Department; between the two senators themselves; and between the senators’ cordial meeting with the Qadhafis in 2009 and their insistence that the Obama administration was being too mild when it helped to overthrow that regime two years later. Of course, none of that has to do with Chuck Hagel, who wasn’t on the trip to Libya and isn’t yet part of the Obama administration. Sen. Graham and Sen. McCain say they just want more information about Libya. I think they could start by being honest about what they told the Qadhafis in 2009. Perhaps they could be the first witnesses at a congressional hearing. As content creators we steadfastly support freedom of expression, however the personal views of individuals associated with DC Comics are just that - personal views - and not those of the company itself. Questions of free speech, political acceptability, and the free market are one thing. But splicing independent clauses with the word “however”—that’s intolerable. The latest irregularly scheduled Oz and Ends award for Batman research goes to Carol Tilley, professor of library and information science at the University of Illinois, who recently published a paper comparing Dr. Fredric Wertham’s statements about comics in Seduction of the Innocent with his actual research notes. What Tilley found in Wertham’s notes, however, was that the boy preferred “Superman,” “Crime Does Not Pay” and “war comics” over “Batman,” and that he had previously been sexually assaulted by the other boy – all information that Wertham left out. That change was crucial because Wertham’s book linked Batman and Robin to homosexuality but didn’t make the same link for the comics that young patient actually preferred. The press release notes other examples where Wertham’s notes and final text don’t match. For example, he left out a lot of pertinent risk factors in troubled young patients’ lives. When a patient described learning crime techniques from “the movies” as well as comics, Wertham mentioned only the comics. I’ve previously noted how Wertham retold a news story about a boy who put on a cape and jumped off a cliff without acknowledging that the character the boy was imitating wasn’t Superman but Mighty Mouse, a character created for the movies. My sister and I loved Encyclopedia Brown, the fifth-grade nerd/observer who seldom took more than a day to unravel the nefarious conspiracies of childhood. Every child detective requires a sidekick, obviously, and I thought Encyclopedia’s sidekick, Sally Kimball, was way cooler than any of Nancy Drew’s. In addition to being smart, Sally was the only kid in town who could beat up Bugs Meany. About the particular criminals Encyclopedia and Sally outwitted, the only one I remember is a cheater in a disgusting-sneakers competition. But as a child I treasured the idea of this infinitely just place called Idaville. In Idaville the weak were rarely bullied for long, and the bad guys didn’t get away. The actual mysteries of Donald J. Sobol’s series were less important, I contend, than the notion they imparted that knowledge and ratiocination could make the world a better place for everyone. And they still don’t all have pants. For anyone reading Flex Mentallo, I recommend also sampling Jason Craft’s online annotations, David Allison’s appreciation and lament for the recoloring, Sean Rogers’s critique for The Comics Journal and the many comments it produced, and Rich Johnston’s response to that critique. I’m not taking sides. I read with some concern a February 6, 2013, letter that you signed with 25 other Republican Senators, demanding that former Senator Chuck Hagel provide additional financial disclosure information in connection with his nomination to serve as Secretary of Defense. This letter appears to insist upon financial disclosure requirements that far exceed the standard practices of the Armed Services Committee and go far beyond the financial disclosure required of previous Secretaries of Defense. . . .
We have applied these disclosure requirements and followed this process for all nominees of both parties throughout the 16 years that I have served as Chairman or Ranking Minority Member of the committee. I understand that the same financial disclosure requirements and processes were followed for at least the previous 10 years, during which Senator Sam Nunn served as Chairman or Ranking Minority Member. During this period, the committee has confirmed eight Secretaries of Defense (Secretaries Carlucci, Cheney, Aspin, Perry, Cohen, Rumsfeld, Gates, and Panetta), as well as hundreds of nominees for other senior civilian positions in the Department. . . . The committee cannot have two different sets of financial disclosure standards for nominees, one for Senator Hagel and one for other nominees. Only a few months ago, the Republican Party united behind a billionaire who offered less personal financial disclosure than any other Presidential candidate in recent history. These Senators’ sudden shift to seeking more information hardly seems to be based on principle, therefore. Some of those politicians appear to oppose Hagel mainly because they feel personally betrayed by his changing appraisal of America’s military activity in Iraq. But it seems unlikely that so many Senators would erect these double standards if Hagel had been nominated by another President. Aw Yeah Comics: Darling and Adorable? 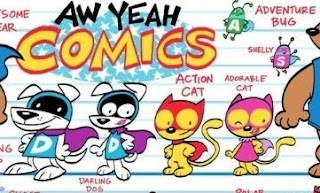 Art Baltazar and Franco, the team behind Tiny Titans and other comics for young fans from DC, are launching their own original comic out of a store they co-own in Illinois, both called Aw Yeah Comics! I enjoyed many pages in Tiny Titans, though I was never sure whether its natural audience was really young readers or the older nostalgic type. I also critiqued a pattern of that magazine showing the girl heroes babysitting a lot more than the boys. In fact, I couldn’t find a boy ever volunteering to babysit. The image above shows part of the cast of Aw Yeah Comics. The main characters are said to be Action Cat and Adventure Bug. On the left of this image is Daring Dog. And the other three animals shown fully are, I’ve read enough comics to be pretty sure, female versions of those first three. Let’s look at the subtle cartoon signals. Shelly and Adorable Cat are very, very pink. Darling Dog and Adorable Cat stand in identical poses, feet turned apart and right hand extended for no reason with left hand high on the hip. Darling Dog is smaller than Daring Dog and has big round eyes. Darling Dog, Adorable Cat, and I believe even Shelly have full pink lips instead of black lines for mouths. And Adorable Cat wears a dress with a frilly collar. Absent long eyelashes and hairbows, I’m not sure how the gender iconography could be clearer. The three male characters are associated with “Daring,” “Action,” and “Adventure.” What’s important about the three female characters? Being “Darling” and “Adorable.” And being a bug with a shell, but that doesn’t seem very individual. Maybe my interpretation is wrong. Maybe Action Cat is also female, so this comic isn’t just another one built around superpowered male characters. Maybe Darling Dog is male, and just as darling. Maybe as the comic develops Baltazar and Franco and their big-name collaborators will have their characters model a wider range of qualities for young female readers. By 1952, owning a dog constituted a democratic rite of passage, no longer the exclusive possession of America’s wealthy aristocrats, who were known to prance around with their purebreds in places like the Upper East Side of Manhattan. 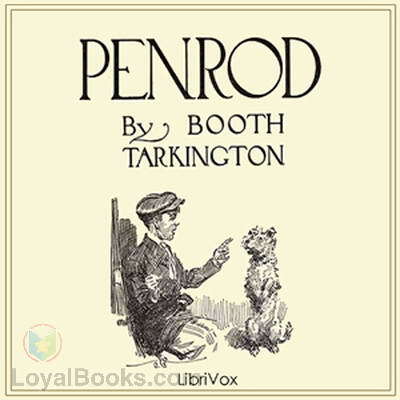 Who knew that, decades earlier, Penrod and Dorothy Gale had been putting on such airs when they took Duke and Toto out for a walk down the small-town lanes of Indiana and Kansas? 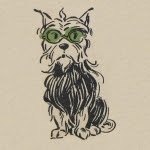 In fact, there is a whiff of aristocracy in naming a dog Toto, as I documented back here—but by 1900 that name was verging on cliché. The dog’s name was undescriptive of his person, which was obviously the result of a singular series of mesalliances. He wore a grizzled moustache and indefinite whiskers; he was small and shabby, and looked like an old postman. Now that is some fine canine characterization. Which is the sort of exchange an intern never forgets. Tarini was thinking of Laura Ingalls Wilder’s Little House on the Prairie books and television series. But those turn out not to be medically accurate. Scarlet fever might produce temporary blindness, but its hallmark is a rash. No letters or newspaper stories about Mary Ingalls’s illness described that symptom. Instead, contemporaneous sources said she suffered from “severe headaches” and partial paralysis of the face. Diagnosis by these disease detectives: viral meningoencephalitis, which causes inflammation of the brain and the meninges, the membrane that covers the brain. In severe cases, it can cause inflammation of the optic nerve that can result in a slow and progressive loss of sight. The study ends by suggesting why Wilder, her daughter and collaborator Rose Wilder Lane, and/or the book’s editors decided to identify Mary Ingalls’s illness as “scarlet fever”: because it already had a literary pedigree. And the book and TV adaptation have been misleading future doctors ever since. DC Universe: Legacies was a comics series published in 2010-11 during an apparent wave of nostalgia at DC Comics. It was scripted by Len Wein, a top editor at the house in the early 1980s, and drawn by a stellar cast of established artists: Joe and Andy Kubert, Dave Gibbons, José Luis García-López, George Pérez, Jerry Ordway, Dan Jurgens, Brian Bolland, and so on. As the series ended, DC trumpeted several single-issue stories about its top characters created in the style of the 1970s, 1980s, or 1990s, using talent that had worked on the characters in those decades. Those magazines had the umbrella label of DC Retroactive. Legacies retold the entire history of the DC Universe as it then existed—the universe that had been created by merging several parallel continuities at the end of Crisis on Infinite Earths in 1986 and remade more gently at ten-year intervals in the Zero Hour and Infinite Crisis crossovers. For the purposes of the weekly Robin, the series notes the debut of the first two Robins, the first two versions of the Teen Titans, and Nightwing, but shows little of Tim Drake, Young Justice, or later Titans groupings. Wein retold that super hero history through the eyes of a kid from Metropolis who grew up to be a police officer and detective. That approach was quite like the way Kurt Busiek and Alex Ross structured Marvels, a 1994 retelling of Marvel Universe highlights through the eye of a news photographer. Legacies’ main storyline is thus a recap of the company’s mythos—just enough for new fans to figure out how events fit together and a trip down memory lane for folks who’d read the stories originally. Wein didn’t try to reconcile or “retcon” gaps in the continuity, which left such glitches as Depression kids becoming a young couple in the late 1980s. (Hey, it’s comics!) With so much “history” to get through, there’s a high panel-per-page ratio reminiscent of earlier decades, but not much chance for deep drama or characterization unaided by reader nostalgia. Wein added eight-page back-up stories about some of the odd corners of the DC Universe: the World War 2 soldiers, the sci-fi adventure teams of the 1950s, Jack Kirby’s New Gods, and so on. Shoved to the back of the collected edition, those little tales might be the most fulfilling because they’re complete tales in themselves, not squeezed to rush on to the next event that might change the entire world. Where does the volume leave readers? For decades the narrator collects accounts of those costumed heroes on pulp paper, filing them in plastic—just like DC Comics’s most devoted fans. And the final pages reveal that he’s an old man in a nursing home, repeating those stories every night for an uninterested and unbelieving audience of attendants. Hardly the portrait readers would want of themselves. Furthermore, just after this series ended, DC had announced that the continuity it recounts would be set aside in favor of a new variation. Was Legacies therefore a test of whether the nostalgia market was big enough to sustain the operation? Was it a sincere attempt to give new readers a way to “jump in” and catch up to the existing universe, only for the company to decide it had to do something more dramatic? Or was it always designed to be what it and DC Retroactive became, a last hurrah for that continuity before the company swerved onto a new path? The Paris Review’s blog recently looked back on the falling-out between P. G. Wodehouse and A. A. Milne. I’d read versions of this story before in the Boston Globe and Robert McCrum’s fine biography of Wodehouse. A particularly pro-Wodehouse retelling appeared in the Daily Telegraph in 1996 and is archived by the Russian Wodehouse Society. Wodehouse and Milne were the same age and from the same class. They socialized and played cricket together, and Milne put up some money for a stage adaptation of one of Wodehouse’s novels. Their careers ran in parallel for a while, both writers striving in various forms and media, particularly theater and fiction. Both men became very popular writers on both sides of the Atlantic, Wodehouse for his farcical novels about British twits and Milne for his four volumes of children’s verses and stories. After Wodehouse was interned by the Germans near the start of World War 2 and recorded a few radio broadcasts for the Reich in 1941, many British authors wrote public letters lambasting him. Milne was among the sharpest critics. He reminded newspaper readers that Wodehouse had spent the previous World War far away in America and had moved around in the 1930s to find tax havens. Many analyses of the rift say Milne was jealous of Wodehouse’s success. Wodehouse himself advanced this idea in his 1975 interview with The Paris Review, and it may have been true. The Milnes do seem to have been capable of nursing great resentment over time. However, both authors were tremendously successful. The difference was that Milne hated how the public and critics had pigeonholed him while Wodehouse embraced those limits. Milne kept trying to write adult novels, plays, mysteries—anything but children’s books. Wodehouse had stopped writing quasi-serious novels like The Coming of Bill and musical comedies and dove into the capers his readers wanted. He also eschewed politics while Milne kept writing about that concern. Ironically, Wodehouse’s stepdaughter Leonora, whom he was very close to and who telegraphed him to stop broadcasting, died in 1943. Thus, by the time Wodehouse was free to digest the controversy, he had actually lost a child during the war. Christopher Milne survived to carry on his own resentments. Twice in the 1950s Wodehouse, now permanently settled in America, used his fiction to attack Milne. In 1975 he claimed to have gotten over the feud, at least enough to appreciate Milne as a writer, but by then Milne was dead. J. L. BELL is a writer and reader of fantasy literature for children. His favorite authors include L. Frank Baum, Diana Wynne Jones, and Susan Cooper. He is an Assistant Regional Advisor in the Society of Children's Book Writers & Illustrators, and was the editor of Oziana, creative magazine of the International Wizard of Oz Club, from 2004 to 2010. Living in Massachusetts, Bell also writes about the American Revolution at Boston 1775. 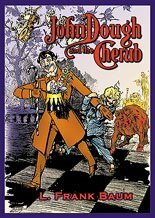 The Centennial Edition of L. Frank Baum’s fantasy novel John Dough and the Cherub, with illustrations by John R. Neill and a new introduction by J. L. Bell, is on sale now through Hungry Tiger Press.